Pruning is an art and a science: it takes somewhat of an artistic eye to develop good plant form while it also requires an understanding of plant biology to make the right cuts. Prior to pruning anything, ask yourself why you are doing it? How will the plant respond if I cut it in a particular manner? When should I prune it? How much should I remove? There are many resources available to help you answer these questions and many more. For more information on pruning decisions, check out our Tree Owner's Manual. All pruning creates a wound that the tree must recover from. Trees have a survival mechanism to close wounds and limit infection by pathogens and decay (compartmentalization). 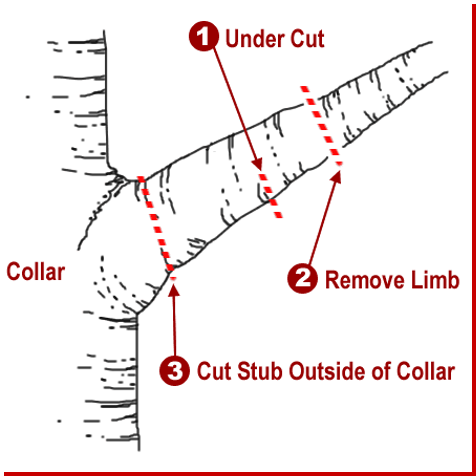 Step 1: Locate a node or branch lateral, referred to as the branch collar. 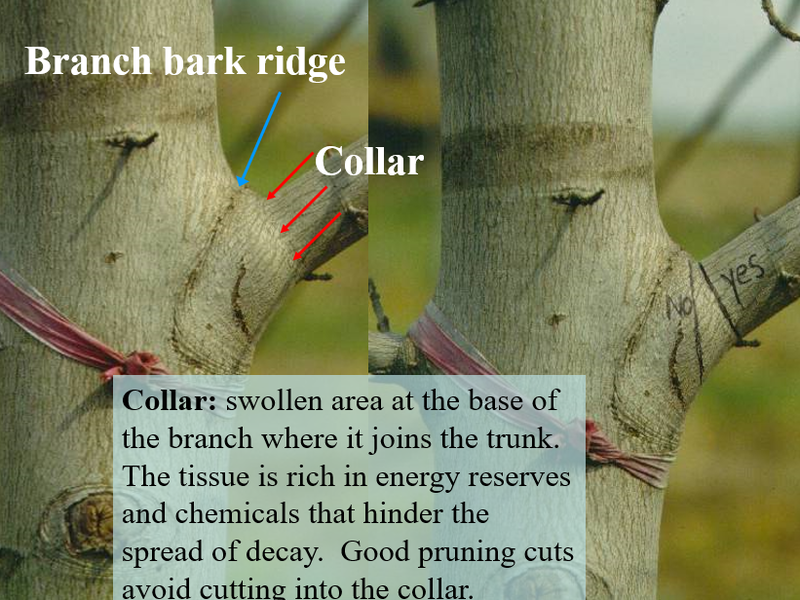 The branch collar is the area of separation between branch and trunk tissues and is usually swollen to help easily identify it (Figure 1). Step 2: Cut just outside the branch collar at a 45-degree angle to the main stem or branch. 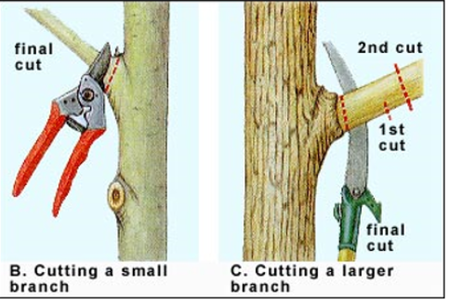 For larger branches (anything 2 inches or larger), it is best to use the 3-cut method (Figure 2). 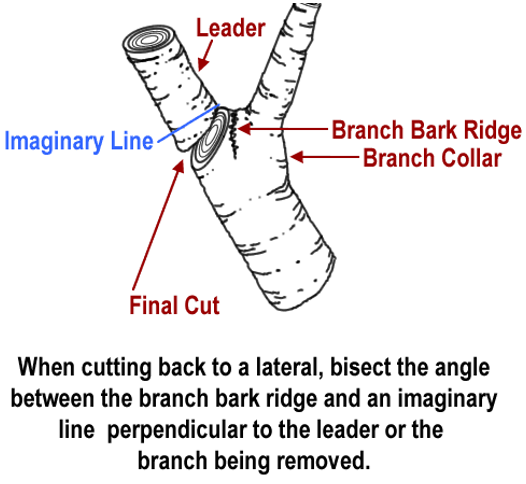 Figure 1: The branch collar & branch bark ridge Figure 2: 3 cut method for larger limbs. Pruning goals include but are not limited to these: cleaning dead or diseased branches from the canopy, raising the canopy for clearance for sidewalks, roadways, buildings, and/or line of sight visibility at road intersections, utility line clearance, training younger trees for structural development, and crown reduction. Each purpose has different guidances. How much should I remove? You should never remove more than 25% of the tree’s canopy in any one pruning cycle. If you are trying to reduce the overall crown size or performing structural pruning, this should be done in small increments, over a few years. Topping is never an accepted pruning practice. Topping refers to the removal of most or all of a tree's canopy in order to reduce a tree’s size or height. Topping will sometimes kill a tree, due to the extreme wounding that occurs. Topping of crape myrtles is the most common occurrence of topping (also called Crape Murder). 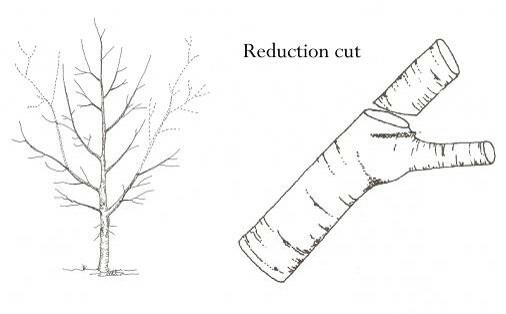 The proper pruning practice to reduce the overall height of a tree (which was probably planted in the wrong site if it needs to be reduced) is called reduction pruning. It causes less injury and is more attractive. You will notice that the orginial form/shape of the tree is not affected when doing a crown reduction. Some trees will require very little, if any, pruning when planted in the right place. 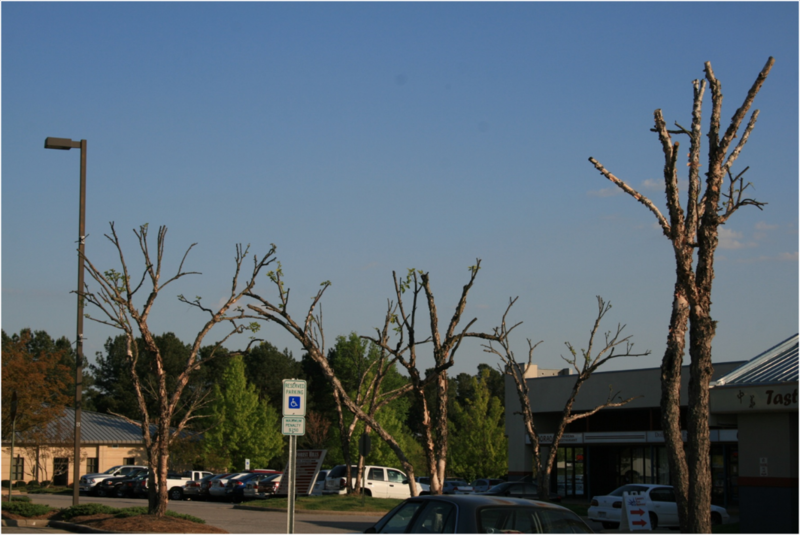 Good pruning can reduce defects and extend the life of a tree. Bad pruning can create defects and shorten the tree’s life.